If you have seen the landscapes at C.X. 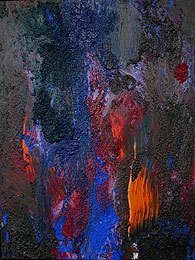 Silver Gallery, the abstract paintings currently on display there might surprise you. The West Brattleboro gallery, which also houses the nascent Asian Cultural Center of Vermont, shows traditional bird-and-flower paintings by Hua Xi, and formerly featured Cai Xi Silver's "Earth and Sky" series, a group of works that are also intense, but considerably softer than the aptly named "Edge" paintings. For the "Edge" series, completed in the 1990s, Silver mixed acrylic paints with different grades and shapes of wood chips that were otherwise destined for the floors of Manhattan meat markets. Then she quite literally swept the resulting medium across the canvas, with a push broom. She also used trowels and other tools -- some of which got stuck in the fast-drying paint and remained part of the piece. The term "edge" will resonate with the viewer in many ways, but Silver uses it primarily to commemorate the process of creation itself -- the border between the physical and the spiritual that she crosses while painting. "'Edge' is the process of stepping in and out of myself," she said. "Each painting is a step toward a higher point -- to leave my body, to become totally free." While these are abstract and spiritually compelled paintings, they represent many edges in the artist's life -- aesthetic and cultural, personal and political. Silver grew up during the Cultural Revolution in China. Her local school closed for two years. When it reopened, schoolchildren were coerced into accusing teachers, neighbors and even their own parents of bourgeois activities. It was a frightening, repressive time for everyone, but particularly for artists and intellectuals. "In China, if you are different from the group, you get into trouble," said Silver. Silver does not use the word "free" lightly. "My father realized I couldn't learn much in school," she recalled. "He told me, 'Learn a skill!' But skills are dangerous." Despite that, Hua Xi taught his daughter calligraphy and painting. "My father quietly brought me art," said Silver. She had mixed feelings, however. "All my practice time was very dreary," Silver chuckled. She hated drawing, because every picture resulted in criticism from one of her parents: "I'm slow, I don't get it, I have a poor sense of color. . . . In China, they don't encourage free drawing; they want to shape you." Silver did not commit to art until her father promised her his beautiful paint box, which could be unfolded and used as an easel. 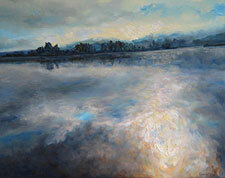 She began using the enclosed oil paints at the age of 17. When China's universities re-opened, she was accepted into a pilot program for fine arts in Shanghai, where she finally learned to enjoy her work. "In college," said Silver, "my teacher encouraged everyone to use fresh paint from the tube. It started to click: I love painting!" 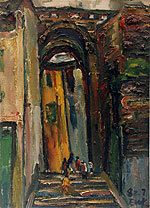 Even at the university, however, she studied only a narrow sampling of Western painters. "At that time, they did not allow abstract painting," explained Silver. Her juvenilia is markedly influenced by post-Impressionists, particularly Van Gogh. "I did not understand abstract paintings," she said. But her study of calligraphy during childhood and of post-Impressionists during college prepared Silver for her later encounters with abstract expressionism. 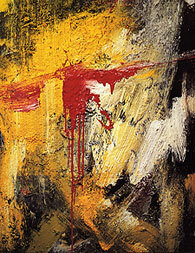 Qixinggang (1982), which depicts a neighborhood in her native city of Chongqing, documents her early interest in bold gestures and colors, and in foregrounding the texture of the paint itself. 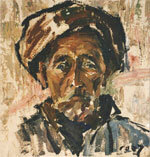 After traveling around rural China for two years painting portraits in exchange for room and board, Silver returned home for a short time. During this period, she met her future husband, Adam Silver, who was in China teaching English as a second language. A year after marrying, the couple moved to New York, where they explored the museums and galleries together. "I saw many different forms of art," Silver said. "Different materials, different concepts and ideas. . . . I began exploring the concrete floor where I'd been walking every day, the weathered walls of subways. I realized everywhere is a painting. Art is possible for everything." This period of discovery still inspires Silver. "Open your eyes! Turn! Everywhere is art!" she said excitedly. With her "Edge" paintings, Silver's interest in the patterns of the city landscape overlapped with her childhood study of calligraphy and her longtime practice of Qigong, traditional Chinese breathing exercises. Creating the works was a full-body workout, requiring awkward stretching and bending. 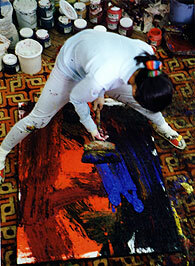 But Silver, a Tai Chi practitioner for many years, executed these large paintings with finesse. The resulting compositions froze the strenuous but exhilarating experience of creation in time, stretching and bending the viewer's own imagination. They are still physical evidence of spiritual momentum. Beyond documenting the process of their own making, the paintings evoke the urban beauty that so impressed Silver upon her arrival in the U.S. 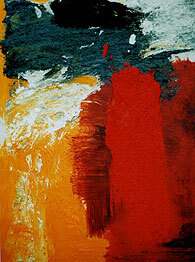 In Edge 136, patches of pure, bright red and orange contrast with darker, blended smears of blue and black. Multiple layers of the paint-and-woodchip medium contrast with dry broomstrokes. Even a bit of bare canvas peeks through, complemented by areas of thick white paint. By presenting a variety of textures and colors, these paintings have a mysterious way of suggesting both urban decay and natural beauty. Edge 137 might be a very convincing aerial view of a river valley, or a close-up of corroding metal. The painting, of course, is neither. But it invites the viewer to enjoy a period of contemplation while ranging among these very different but equally interesting suggestions. Most of all, it demands that we appreciate the colors and textures for their own intriguing and beautiful sake. 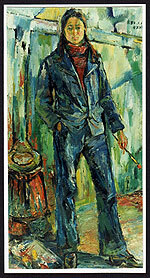 While that might not sound particularly radical to Americans who grew up during the second half of the twentieth century, totalitarian regimes have long considered abstract painting -- or any form of expression that exists for its own sake -- to be a subversive art form. Abstract painters were even championed as "anti-Communist" (and surreptitiously funded) by the U.S. government during the Cold War. 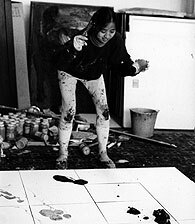 To be sure, however, Silver did not make her Edge paintings as a political statement. While they arose from her sudden exposure to the great variety of Western art, this body of work responds to an even deeper sense of freedom, a kind that no political system can guarantee or suppress. "Artwork somehow taught me to let go, to not control," said Silver. "Wherever I go, I absorb the surroundings. Whatever happens to me . . . let it go." 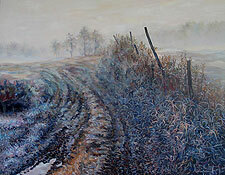 This profound openness accounts for Silver's return, after twelve years, to representational painting. "My environment changed from the city to the country," she explained. "I cannot ignore the beautiful landscape here. It makes me feel so small." While her painting style has changed, however, Silver maintains that the act of painting -- the constant crossing of the boundary between the physical and the spiritual, and the experience of "melting" into the work -- remains the same. Her paintings still celebrate and draw the viewer into a moment of aesthetic ecstasy, of standing outside the self and feeling completely free. It is not an experience to take lightly.